Our friend Mehrdad - also known as the Desert Fox - was full of enthusiasm and excitement when he came to tell us about his recent trip. He and a few others had done what nobody else had done before. He told us how, after 6 expeditions he had at last achieved his dream, which he had started some 12 years ago. In a few lines I will try to explain what he and his friends had done. 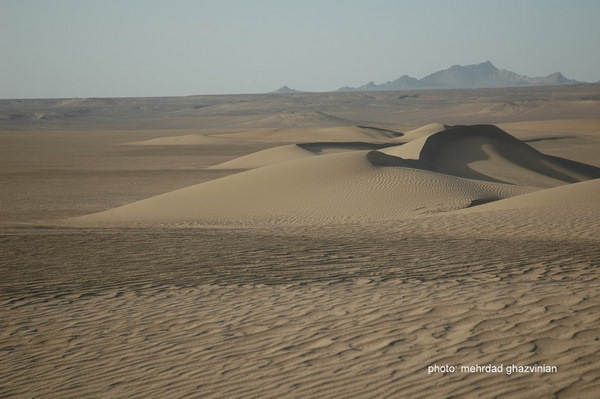 The Lut Desert is a huge dry salt lake in the south east of Iran which is about 480x320 kilometers in area. In the south it is close to Bam, to the east is Kerman and to the west is Zahedan. 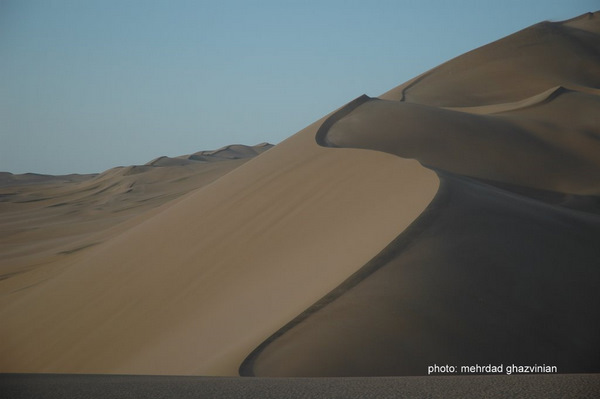 The desert consists of three major parts, a western part which is mostly sand mountains, a central part which is mostly flat and is covered by small sand dunes but there is quicksand and mud around so it is not all a smooth ride and then there is the eastern part, with ridges of massive sand dunes running east-west. Nobody had ever been inside this area - many had tried but failed. 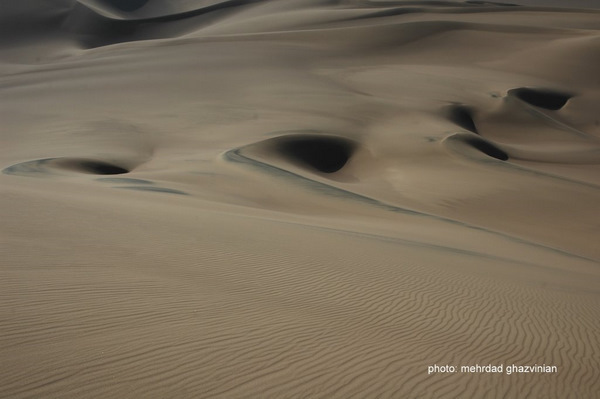 Here they have the highest sand dunes in Iran and probably in the world but that is to be verified. They are more than 700 meters high. Most people who go into the desert arrive from the north and leave from the south of the central area. 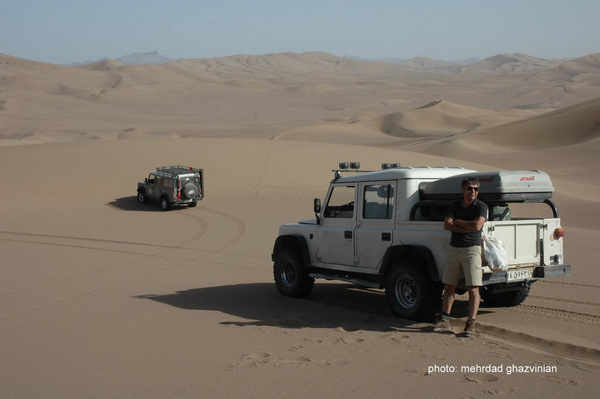 Our Desert Fox told us that nobody, apart maybe from a few drug traffickers on the run had ever been to these very high western dunes by car, camel or by walking although some had tried unsuccessfully. Some had flown over it and no one has ever claimed to have crossed these massively high mega dunes to get to the west side. Mehrdad, Babak, Hassan, Mehdi, Annette and Daniel with their kids were the first to have done it. Mehrdad praised his brother Babak, whom we had the pleasure to travel on short trips twice the year before, for his good comradeship and team work, a calm and cool yet very able technician. A day before the Iranian New Year they started off early in the morning in four cars for a journey of a lifetime which lasted ten days. They were fully equipped and had 140 spare liters of gas for each of the cars after they filled up at the last gas station on the way, a large amount of water and food, GPS and satellite telephone, plus good team players and great enthusiasm for adventure including the kids. They visited Khosf, Mehbadan and Dehsau before entering the desert. Mehrdad told us that there are two major misconceptions about the Lut. One is that it is the hottest place on earth, and the other that no life, even bacteria can exist there. The temperature often rises above 50 degrees but in his opinion it is nothing like as high as the figure of 70.7 degrees sometimes claimed. Life does exist in the desert and he had film and photographs to show it. They had seen lizards, a unique rat called dumb-e mesvaki (toothbrush-Tail) they saw sand cats, migrating birds flying, falcons, foxes and others. They had also seen very large green vegetation. 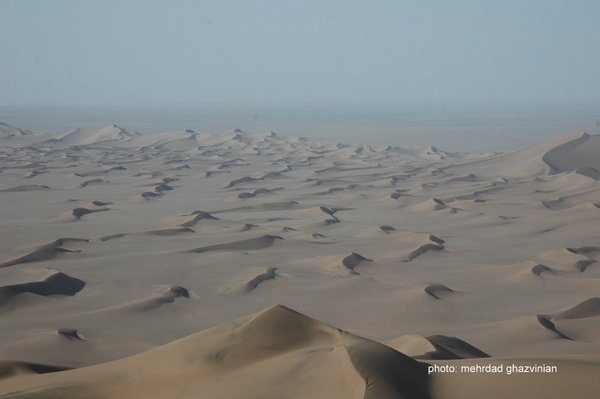 They drove many kilometers from the north of the desert until they got to the central edge of the eastern part where set up their base camp. This part is not very friendly and has high rocks which reminded you of the rock surface of the moon - they were all excited planning and trying to work out how to get through the eastern part. 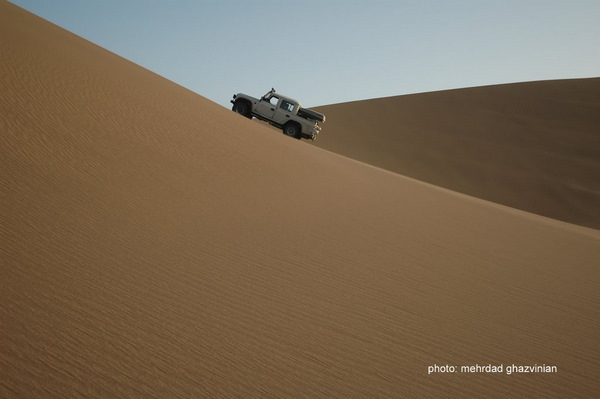 During one of the explorations to find out how to approach getting across, Mehrdad and Babak felt the sand avalanche, he told me that as they were walking back to check which direction to take he felt something quite weird and sensed that the sand moving with him and realized they were going deeper and deeper into the sand. Suddenly the moving stopped but they were up to their waists in the sand. They were very patient and somehow found the strength to do a lot of trial and error explorations up and down the ridges but usually only with two cars to keep the camp going and to save on petrol. Everywhere there were huge mega dunes surrounding them. 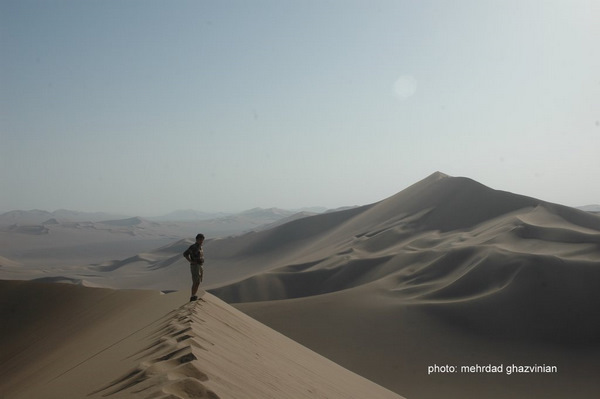 Mehrdad walked up one dune which took him over two hours and from the top he saw a passage, showing the direction that they must take to get through the ridges and back to the camp. It was then that he saw two birds migrating to a new home which was most bizarre in the middle of the desert. 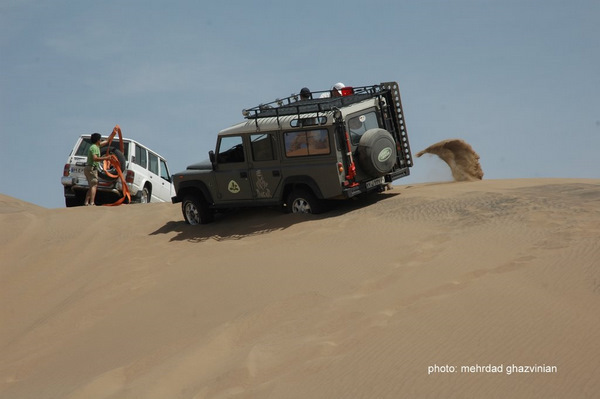 They set off in two cars, on each side there were sand dunes 700 meters high, they did a lot of turns to get through the passage that got them through and enjoyed a fantastic sensations and views. As they drove slowly further and further they entered a different world. Towards the end of the crossing they found a unique piece of dark grey rock, about 12 kilos in weight, which they thought must be a meteorite, and samples have been sent to a laboratory to confirm this. They also found some large green bushes, some still green and they used the dead ones for their camp fire on their way back. 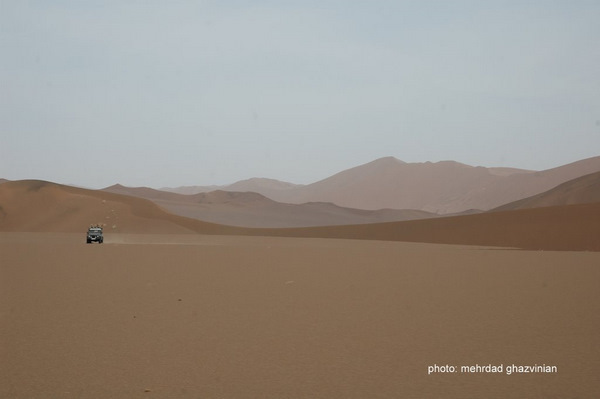 They all felt great for having done something that no one had done before, crossing the eastern side of the Lut desert in a car and returning. The next day they started back and came to Kishit village where they had to go through the river bed which was the road with its much welcome water (complete with ducks) even if it was very salty. Then they made their way back on the main road towards Tehran. We have seen this adventure on video and we hope to be able to help him make it into a documentary - it is quite sensational. The photos do not justify the great sense of vastness that one feels, when nobody had ever been there. What a great feeling it must have been!! Reprinted with permission. This article originally appeared in the Payvand Iran News.